The Kamogawa River cuts across the city of Kyoto from north to south. The area to the east of the river is called Ohto. 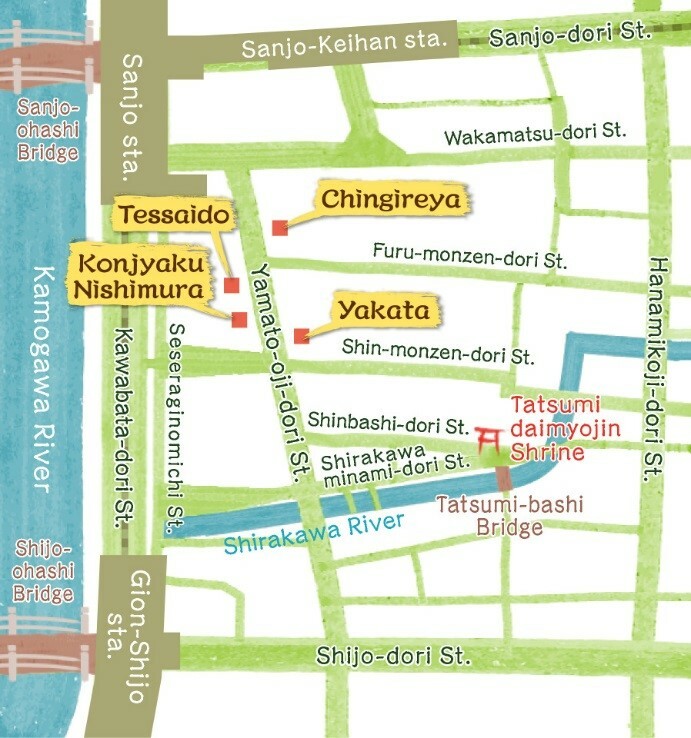 In the Ohto area, the district lying between Furu-monzen-dori and Shin-monzen-dori Streets, which run west from the famous Chionin temple toward the Kamogawa, and between Yamato-oji-dori Street, which runs parallel to the river, and Hanamikoji-dori Street, which links the southern and northern ends of Gion’s entertainment area, is lined by many antique art shops. While an antique art district in the ancient capital of Kyoto certainly sounds attractive, the high-class shops might also be rather intimidating for laypersons. IHCSA Café therefore visited the Yakata antique shop in the Ohto antique art district and asked its owner, Mr. Yoshitaka Tachi, for some hints about how to enjoy this town of antiques. 1. 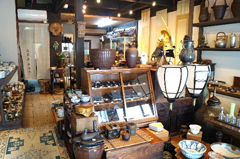 The antique shops in this district belong to the Ohto Antique Art Association. What are the characteristics of this association? 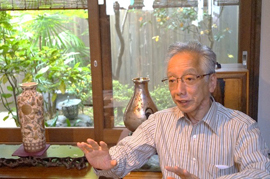 Mr. Tachi: The Ohto Antique Art Association was founded about 50 years ago. The antique art handled by the members of the association is diverse. Each shop has its own special fields and unique features. 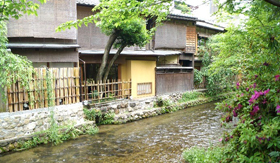 The items handled are high-quality, and the large number of shops gathered in the narrow district has no parallel in Japan. For this reason, the district constantly attracts attention from collectors both in Japan and overseas. Coupled with the local atmosphere, which retains the ambience of Kyoto, we are proud to say that it is one of the leading antique districts in Japan. 2. I’m sure each shop has its own characteristics. As examples, what are the characteristics of your shop and other notable stores? Mr. Tachi: One characteristic of my shop, Yakata, is that more than 70% of the items are purchased directly from customers. 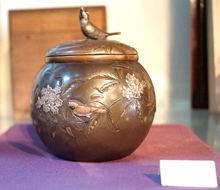 Many good-quality antique art works are lying in the warehouses of prominent households in Kyoto. When these households decide to sell, in a process called kuradashi [warehouse clearance], we can get our hands on antiques that have not been circulating. Such previously hidden items are called ubuni [new stock], and they are very popular among collectors. When there is a warehouse clearance, I buy not only the works of art but also small items, like dishes, that have been used by that household for generations. Households that have good antiques also have good cutlery and other everyday items. Because of the large number of new items, others in the antique business come to my shop to make purchases, and collectors regularly visit to see if we have any rarities. Let me introduce a few shops that handle different things. First of all, there is Chingireya, which specializes in old fabric, that is, fragments of cloth with a long history, such as the jodai-gire of the Asuka [593–710] and Tempyo [729–749] periods, the meibutsu-gire of the Kamakura [1185–1333] and Muromachi [1336–1573] periods, and the jidai-gire up to about the end of the Edo period [1603–1868]. For instance, when mounting an old painting, ideally fabric of that period is used. Chingireya is well-known both in Japan and overseas. 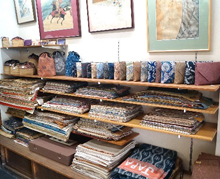 Foreign museums often come here to purchase fabric either as a type of Eastern art or for use in mounting paintings for display. 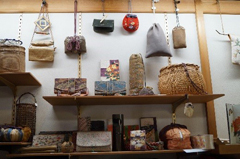 The shop also has other items on sale, such as reasonably priced purses using fabric pieces of the Edo period. Apparently in the back of the shop there is also jodai-gire fabric from Shosoin [the treasure house at Todaiji temple]. Another shop is Tessaido, which specializes in Japanese paintings and hanging scrolls. The shop’s sign was written by none other than Saneatsu Mushanokoji [1885–1976], which is testimony to the fact that this famous novelist was a customer a long time ago. 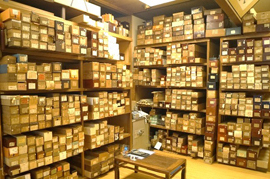 Inside the shop, from the floor to the ceiling the shelves are crammed with long, narrow boxes containing numerous famous Japanese paintings. Tessaido also differs from other shops in that it provides appraisal services for works by famous Japanese artists. For example, it evaluates the authenticity of works by such well-known artists as Yoson Ikeda [1895–1988], Chikkyo Ono [1889–1979], and Fuku Akino [1908–2001], all of whom were recipients of the Order of Culture. 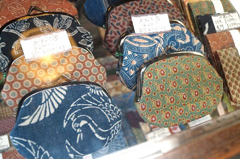 Finally, let me mention Konjaku Nishimura, which specializes in kimono and items made from pieces of kimono. 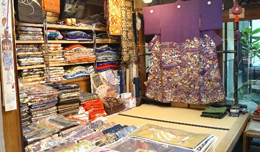 This shop, which is well known to connoisseurs, handles kimono and old fabric that used materials and techniques not available today. I won’t tell you any names, but I often see some famous actresses doing their shopping there. 3. Since they handle expensive articles, I guess there are certain taboos to be followed when viewing and buying antique art in the shops. With reference to your own store, please tell us what first-time visitors to an antique shop should be careful about. 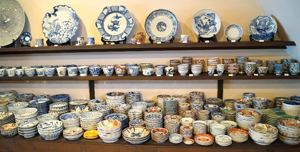 Mr. Tachi: Antique shops all have a love for old art and antiques and spend a lot of time and money collecting them. I think of my shop as my private home displaying objects that I like. In that case, visitors should come with the feeling that they are stepping into the owner’s private house, viewing the collection with his permission, and then, if they like something in the owner’s collection, buying it. So when they enter the shop, it is polite for visitors first of all to say, “Do you mind if I look around?” Of course, I would never refuse. [Laughs] The next important thing is to leave any baggage you are carrying with the shop assistant. 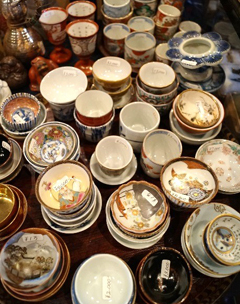 The reason is that antique shops are often very cramped, and the objects on display include extremely expensive items and easily breakable articles, like chinaware. If the baggage hits and breaks an object, it is irreparable. The shop assistant will store your baggage in a safe place. If you want to not only view but also touch an item, ask the shop owner or assistant for permission first. And if you do take up an object, be sure to hold it firmly in both hands. There are some articles that may be damaged by metal objects and things like that, so it’s safer if visitors take off rings and wristwatches. Also, visitors should roll up their sleeves so that items are not caught by the cuffs, and they should take off, or at least be careful with, long necklaces, because these might hit articles when visitors bend down to look. Shops cannot become members of the Ohto Antique Art Association unless they can be trusted in terms of both quality and price. Furthermore, in my own case, when I purchase items, I tell the seller what my selling price will be, and I sell things at respectable and fair prices. So not only here but at all shops that are members of the Ohto Antique Art Association, it’s impolite to try and bargain. Visitors should understand that we are a different class from flea markets and souvenir stores. Among the antique shops around here, there are stores that only deal with professional buyers or genuine collectors with an eagle eye for antiques. But at my shop, and at the shops that I introduced earlier, while there are expensive items on sale, at the same time there are smaller articles priced at around \2,000–\3,000. So as long as they follow the rules that I spoke about, even first-time customers can enjoy shopping here. 4. When they shop in this antique district, how should visitors like me, with no knowledge of antique art at all, select what to buy? Mr. Tachi: Well, visitors are going to have a budget, of course, so they should look for what they like within the limits of their budget, without getting too carried away. In the end, most customers seem to choose things that have something to do with them, like items relating to the zodiac or, if they like cats, items with paintings of cats. It also gives us pleasure when customers buy things that they can enjoy using in their daily life, such as ceramic sake bottles and cups if they like sake. 5. Finally, can you recommend a few places that people should also see when they visit the Ohto antique art district, such as townscapes or historical sites? 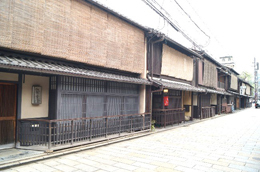 Mr. Tachi: To the south of the Ohto antique art district, between Shimbashi-dori and Shirakawaminami-dori Streets, there is a conservation area of important traditional buildings. 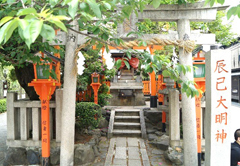 The streets are lined with structures built in the machiya teahouse style. Even in Gion, it’s the most Gion-like atmosphere you can find. Sightseers also like to take photos of the scenery around Shirakawa River, which flows gently toward the Kamogawa, and on Tatsumi-bashi Bridge, which crosses the Shirakawa. And near Tatsumi-bashi Bridge there is Tatsumi Daimyojin Shrine, where geisha and maiko [apprentice geisha] go to pray for the improvement of their entertainment skills. Before and after enjoying the antique art, visitors should definitely take a stroll around the area to get a taste of this very Gion-like, very Kyoto-like atmosphere.